In Bloggers Talk Steampunk, a variety of contributors attempt to define steampunk (this includes a post by me--third entry down; look for the image of STEAMBOY). 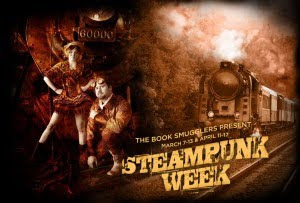 The Book Smugglers will feature all kinds of steampunk goodness this week including reviews, features on steampunk films, and steampunk art & design. Click here for the full calendar of events.